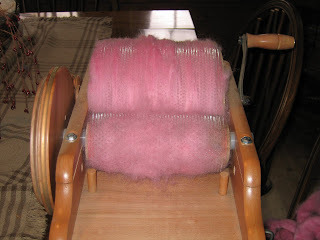 Here is a picture of some beautiful alpaca fiber I dyed pink. It reminds me of cotton candy! You almost want to eat it. It's so soft. The machine you see it on is called a "carder". It has hundreds of tiny metal teeth. The two drums meet and as it turns it seperates the fibers and turns it into a "batt" that makes it easy for spinning.